South Korea and the United States will hold talks next week on issues related to the bilateral agreement governing the legal status of American forces here, the Ministry of Foreign Affairs said Friday. The 199th joint committee meeting on the Status of Forces Agreement will be held at Pyeongtaek City Hall on Tuesday. South Korea will be represented by Kim Tae-jin, director general of the ministry's North American affairs bureau. His counterpart will be Lt. Gen. Kenneth S. Wilsbach, deputy commander of US Forces Korea, which has around 28,500 service members. The annual session is not expected to yield the announcement of a special agreement. The ministry said the two sides will discuss issues of mutual concern and review the operation of the SOFA over the past year. It attached meaning to the venue for the upcoming talks, which will be the first since the June relocation of the USFK's headquarters to Pyeongtaek, some 70 kilometers south of Seoul, from Yongsan Garrison in the capital. 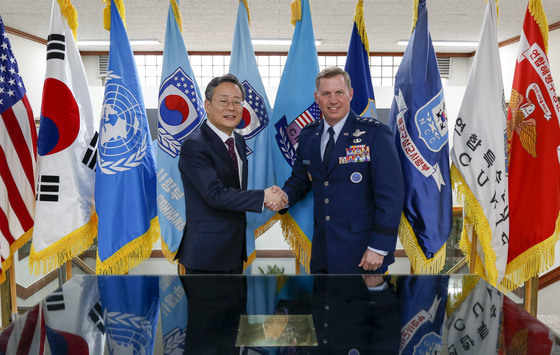 "Besides the symbolic meaning, it will be the first time (for the meeting) to be held at Pyeongtaek City Hall to reflect efforts to develop harmonious and mutually beneficial relations between the USFK and our regional community," the ministry said.